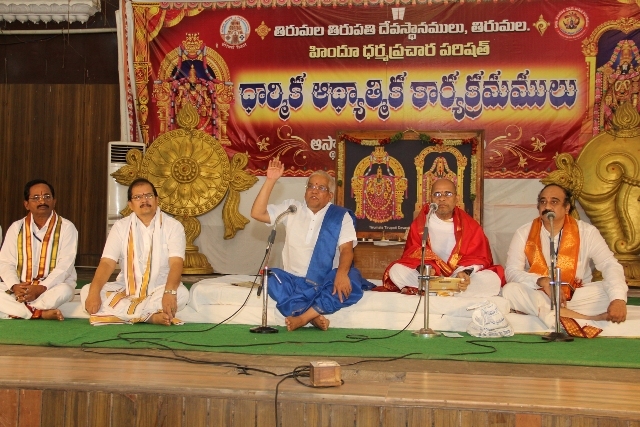 TIRUMALA, SEPT. 26: The knowledge of vedas is vast and infinite and there is no end to this divine wisdom, said TTD EO Sri MG Gopal. 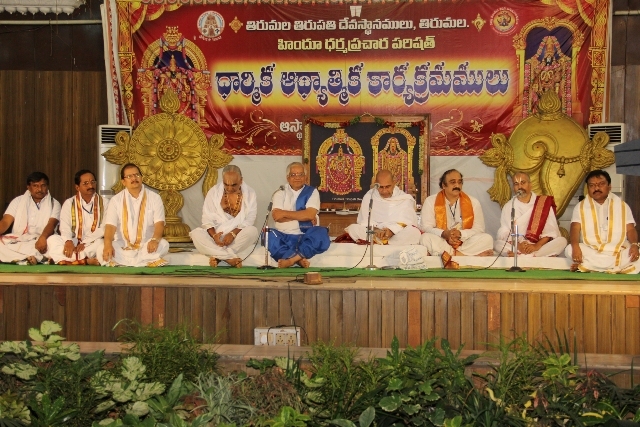 Addressing the Veda Vignana Sadas organsied by SV Vedic University and SV Higher Vedic Studies at Asthana Mandapam on Friday, the EO said, the Vedas happens to be the oldest and anceint sacred texts which has abundant information that is beneficiary for humanity. The methodologies and logics prescribed in vedas about life, behaviour, medicine, law, agriculture etc. is the ultimate to lead a prosperous life”, he added. Adding further the EO said, but unfortunately, the a misconception developed in the socity that vedas belong to only a sect of people and not applicable to all which is incorrect. 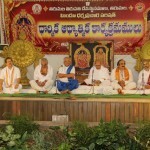 The essence of vedas is for the welfare of entire humantiy. Vedas are considered to be the words uttered by none other than the divine forces. So every word and each spell has the power to transform evil to good”, he added. Givine an instance the EO said, “If we recite vedas with devotion then the mother nature will bestow her blessings upon us. 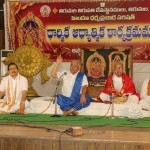 When we performed Pavitrotsavams, Parjanya-Varunajapa-Adbhuta Shanti Yagam in Tirumala, we had experienced the results directly. When the entire temple city is reeling under severe heat and immense scarcity of water, after the performance of the vedic rituals, there was heavy down pour and today we have all the dams full to their capacities”, he added amidst the huge applaud of the audience. 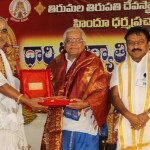 Later in his speech, noted Vedic scholar Mahamahopadhyaya Dr Vishnubhatla Subrahmanya Salakshana Ghanapathi said, “Tirumala happens to be the Nabhisthana (Centre point) for the promotion of Vedas. 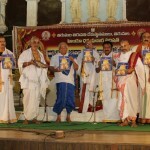 My hearty congratulations to TTD mandarins for taking up programmes related to the promotion of vedas in a wide spread manner”, he added. The renowned vedic scholar said, there are 1000 sakas in Sama, 21 in Rig, 101 in Yajur and nine in Adharwana vedas. But today we have only a few left. A lot of research work need to be taken up to extract this valuable sources of knowledge in the country”, he added. 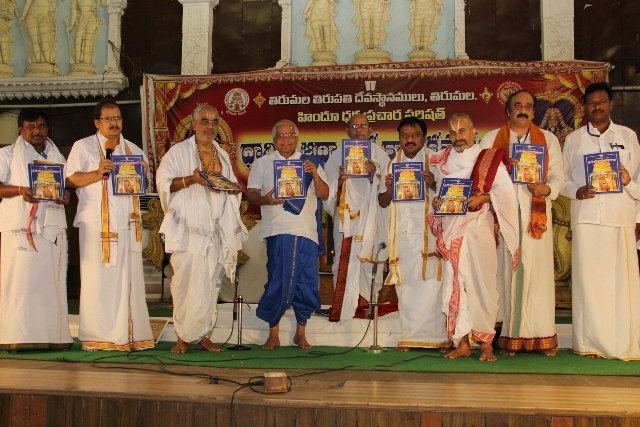 Later EO released the souvenir of Sri Venkateswara Vaibhavotsavams which took place at Vizag couple of months ago. 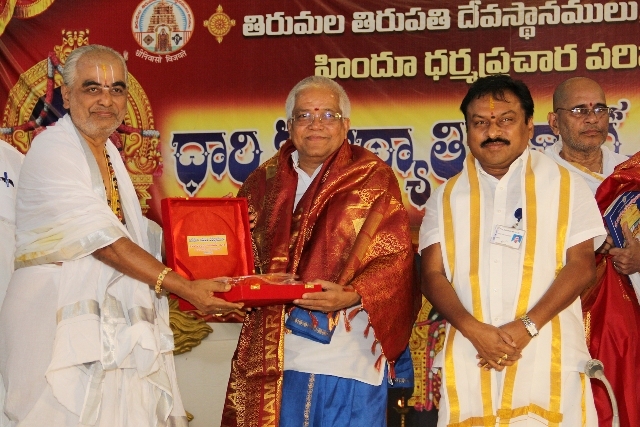 He later felicitated the officers of TTD including one of the chief preists of Tirumala temple Dr A V Ramana Dikshitulu, JEO Tirupati Sri P Bhaskar, Deputy EO Services Sri Siva Reddy, HDPP Special officer Sri Raghunath, PRO Sri T Ravi, Deputy Director of Garden Department Sri Srinivasulu, Health Officer Dr Venkatramana, Kalyanotsavam Project Special Officer Sri Ramachandra Reddy and others for making the spiritual event a grand success. Organisers of the vedic meet, SV Vedic University VC Sri KE Devanathan, SV Vedic Higher Studies supervisor Dr A Vibhishana Sharma were also present.